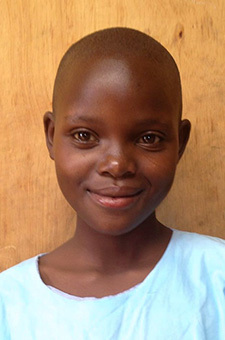 Millicent Auma is 11 years old and is from the Luo tribe. She is in Class 2 where she likes to study her favorite subject math. She loves to be drilled with math problems and delights in giving the answer in English with a huge smile. This is not because she is good with English, but because it is very challenging for her, and so she likes to practice to become better at English. Millicent is very social and vibrant, she loves to play soccer, and her favorite color is red. One day Millicent would like to be a policewoman.